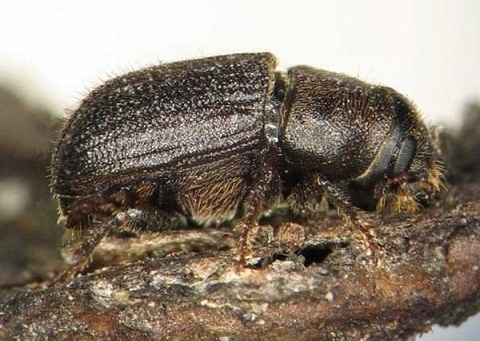 The Mountain Pine Beetle (also abbreviated as ‘MPB’) is an invasive species of arthropods native to parts of the North American continent that are infamous for attacking millions of pine trees in the local forests. 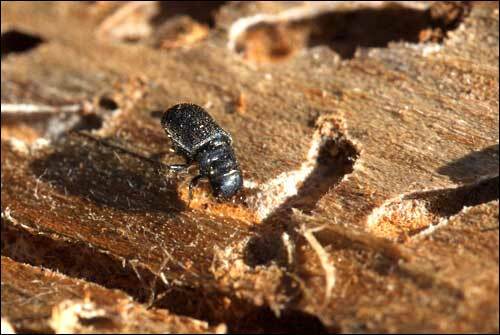 Adequate measures have been taken for stopping the mountain pine beetle. However, these beetles do not bite humans and are harmless. Identification: The gradual curves on the hind wings in the adult of the species differentiate them from the other black beetles that usually have sharp spines along their hind wings. The head has a pair of elbowed, club-like antennae. Size: The length from the head tip to the end of the abdomen is 3.7 to 7.5 mm (average is 5 mm). Body: Black in color with a cylindrical shape. A hard outer cover shields the entire body that includes the head, the thorax, and the abdomen. Feet: Like most other arthropods, there are 3 pairs of thorny legs. The average lifespan of these arthropods is one year in the wild. The mountain pine beetles generally prefer living in regions with moderate temperature within an elevation range of 0 to 3352 meters in the temperate and terrestrial pine forests of western North America, which includes parts of the United States and Canada. Currently, no subspecies of these beetles have been defined by the biologists. This species, like other beetles, develop through four stages, viz. egg, larva, pupa, and adult. Except for an adult’s emergence from the bark, all the other three stages are spent inside the bark of the trees. The female will usually lay approximately 75 eggs. After fertilization occurs, the males will give company to the females for about a few days to three weeks. The beetles are active throughout the day. Their mating season is around July or August, and breeds once a year in warmer regions, and sometimes once in two years in areas that are cold. The gestation period of the female is 10 to 14 days. When an adult beetle finds a new tree, it releases a pheromone that attracts several other beetles to the same spot, initiating a further attack to the specific tree, as also the other trees around. The male beetles that are attracted to the pines secrete their own pheromones, thus attracting more and more females to the site where they eventually indulge in mating, giving birth to the next line of beetles. The eggs are usually white, and the larvae are typically white with a brown head but have no legs. When a tree becomes almost saturated with insects, the existing beetles signal others to infest the adjacent trees. Case studies conducted by scientists have shown that the present-day global warming, leading to a drastic climate change, resulting in warmer summers and milder winters, has played a vital role in the infestation of these beetles, eventually causing hundreds of millions of trees to die every year. This loss has, in turn, created a considerable impact in the economic front (like in the wood industries). 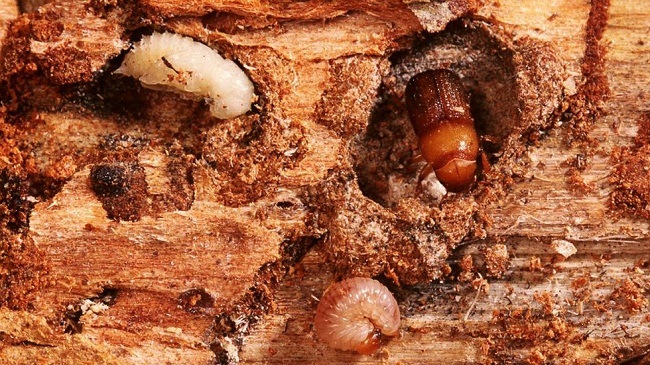 These beetles affect large pine trees by laying eggs under their barks, making the tree hollow and introducing blue stain fungus into the sapwood. This process eventually prevents the trees from producing tree pitch flow to repel and kill the beetles. The fungus produced blocks water and nutrient from transporting into the tree, thus killing them gradually. Also, as the trees begin to die, they dry out in millions, increasing the chances of forest fires in many places around their habitat. Winters in areas closer to the Arctic Circle, like Canada, often have a temperature below -40°C, which generally kills this invasive species, along with their eggs and larvae since they have very low cold tolerance. spores introduced into the tree. As a defense mechanism against predators, these insects use a procedure called ‘aggregation pheromone’ in which case, an individual (usually a female, but also a male, at times) secrete a chemical in order to call for other individuals (of both the sexes) to gather at the specific place and form a group for a mass attack. The primary enemies of the mountain pine beetles include a few species of birds, particularly woodpeckers, and a variety of insects. 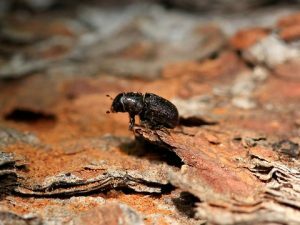 During a 1996 mountain pine beetle outbreak in the Black Hills (Rocky Mountain National Park), the USA, around 435,000 acres of forest area were impacted and damaged by these creatures because of infestation. In this connection, several action plans were adopted by the administration concerned in order to control these pests. A similar kind of infestation took place in Canada’s oldest national park, the Banff National Park, located in BC. ‘Fall and burn’ is a process of cutting (felling) and burning down the beetle-infested host trees in order to prevent them from spreading further. Since its first outbreak in British Columbia in the early 1990s, the creatures have killed almost 50% of the total volume of commercial lodgepole pine. 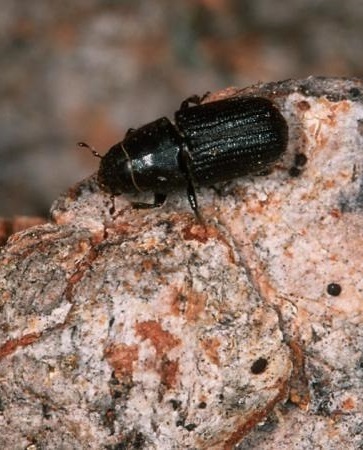 It is the female beetle that initiates an attack on the pine trees. The primary host of these insects is the lodgepole pine (Pinus contorta), though the MPBs can attack almost any pine species.